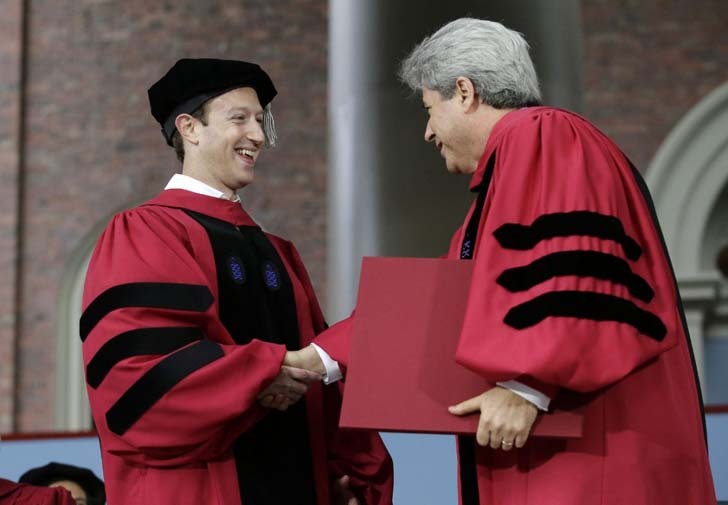 Mark Zuckerberg offered anecdotes about his challenges building Facebook during today's Harvard commencement address. Here's a closer look at his speech. Mark Zuckerberg is an unlikely commencement speaker, something that he acknowledged in his opening remarks at today’s graduation ceremony. He famously dropped out of Harvard during his sophomore year to pursue his then-startup, Facebook. He’s also 33, which means he is “technically in the same generation” as this year’s graduates. Purpose is one of those inspirational buzzwords that pops up in many college graduation speeches. After all, if you didn’t pull all-nighters, sweat through exams, and pay tens of thousands of dollars in tuition fees with some larger purpose in mind — whether that’s making money, changing the world, or something in between — why did you bother? But Zuckerberg is probably one of the best people to speak to a sense of purpose that goes beyond one person’s ambitions. Facebook is a global, multi-billion dollar company that touches on almost everything we do each and every day. It’s where the average person, over the course of their lifetime, is expected to spend a full year and seven months. But it wasn’t always that way. Zuckerberg laid out a three-step roadmap for creating purpose: establishing and taking on big projects (his lofty examples include building the Hoover Dam and immunizing children against polio); pursuing equal opportunity for all; and building community. He’s written a lot about community and purpose before, in relation to the business he’s building at Facebook.